Cleaning strength of abrasive particles added to toothpaste. 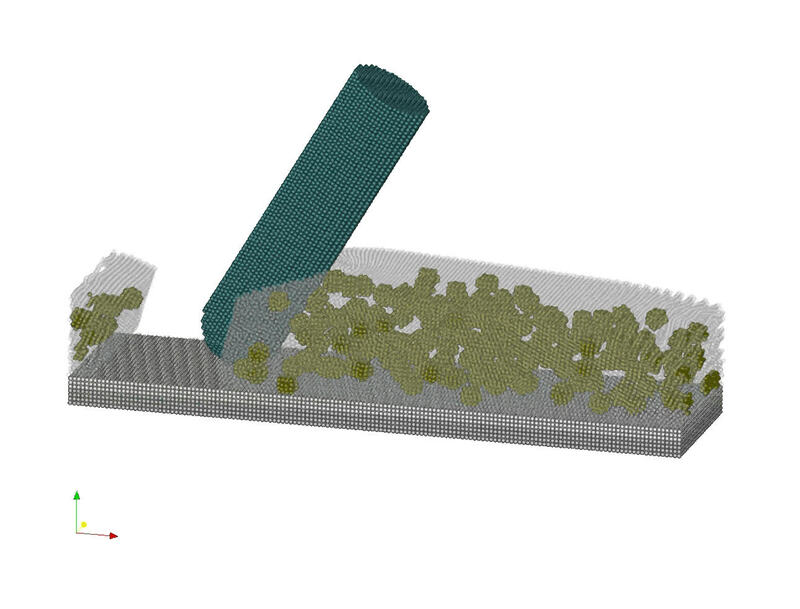 The video shows a thoothbrush filament moving through a numerical model of a toothpaste enriched with abrasive particles. At the bottom of the simulation domain, an idealistic model of enamel is implemented. It was studied how the abrasive particles interact with the toothpaste fluid and the toothbrush filament. The influence of the abrasive character of the toothpaste can be studied by the induced stresses into the surface of the enamal. The primary goal of this investigation was to study the interactions between a toothbrush filament, the abrasive particles within the toothpaste suspension and the tooth paste carried fluid. The diameter of the filament is 200 $\mu$m while the size of the abrasive particles is 50$\mu$m. The carrier fluid is modeled as a newtonian fluid and has a viscosity of 20 mPas. The velocity of the filament is 0.01 m/s and is path controlled, meaning that it is forced to move at a certain velocity and on a horizontal trajectory. The enamal is model by an idealistic workpiece with generic parameters. The abrasive character of the suspension can be investigated by the induced stresses into the workpiece surface. It can be shown that the abrasive character of the toothpaste is determined by the interaction between the abrasive particles and the toothpaste. The trapping of particles in front of the filament is mostly responsible for the stress input in the surface of the generic workpiece which is thus a relative measure for the cleansing effect of the toothpaste for the removal of any harmful biofilm on the teeth. The simulations were carried out using SimPARTIX.